The working ground breaking allowed volunteers to participate in the excavation work for the start of this project, which will erect a Gold Star Families Memorial Monument. Gov. 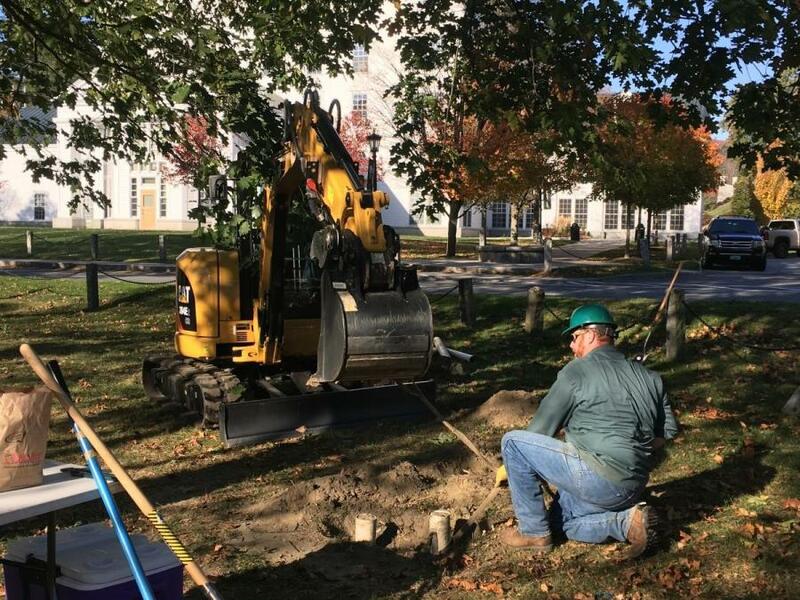 Phil Scott joined members of the Northfield community, Norwich University and gold star families to break ground on a new monument that will honor those families in Northfield's Center Park. The working ground breaking allowed volunteers to participate in the excavation work for the start of this project, which will erect a Gold Star Families Memorial Monument. These monuments, which are constructed in partnership with the Hershel “Woody” Williams Medal of Honor Foundation, honor gold star families — those families who lost a loved one while he or she was in service of our military. The monument will be made of four “black mist” granite monoliths and set on a Barre-granite base. The construction of the monument is supported by funds raised by Vermonters United to Help through Gov. Scott's inaugural gala, as well as in-kind donations from local vendors. The event was attended by local Gold Star Families, as well as Norwich University's President Richard Schneider and trustee Martha Rainville; Vermont Army National Guard Survivor Outreach Services Support Coordinator Tammie Conner; Vermont Secretary of Administration Susanne Young; Rep. Maxine Grad (D-Moretown); and many members of the Northfield community.